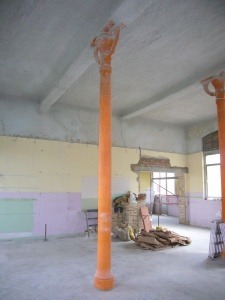 We often refurbish buildings and stores with casting pillars of hollow section. This type of constructive element was very common at the beginning of the last century. Due to aesthetic reasons, they are often pretended to leave seen which means a problem when legalizing the activity once the local is reformed to certify its fire resistance, since there is no existing rule regulating the fire resistance of these elements. Nowadays, metal structures used as structural elements are made of steel and the test regulation UNE EN 13381to determine its carrying capacity “R” before the fire is based on this material. The cast pillars are made of iron, this means that they don’t use carbon, this is why its fire behavior is worst and the critical temperature is lower. In its favor, we have to say that buildings were not built the same way than now. Nowadays, we calculate the minimum section of steel needed to withstand the applied loads (within the safety margins allowed by regulation), and a century ago, calculations were much more experimental and the elements section is usually, in most of the cases, factored in more than 20% of that required according to the efforts they bear. There are studies maintaining that those pillars only work in compression, this section growth required counteracts the lack of carbon in its composition and that they can be treated for fire resistance as if it was a regular steel pillar. We calculate its massiveness or form factor and protect it with intumescent paint (Teclack), Mortars (Tecwool F), or silicate panels and magnesite (Tecbor) for the required fire resistance. The General Direction of Prevention, Fire Fighting and Rescue of Generalitat of Catalonia, has released a circular “SP-130-2015” which reviews the legalization of such elements and it is a little strict. It says that in order to ensure the fire resistance with coatings, we can apply theUNE EN 13,381 -8 as if it were a conventional steel pillar but we should calculate the coating thickness for a critical temperature of 350ºC and not 500ºC as usual.